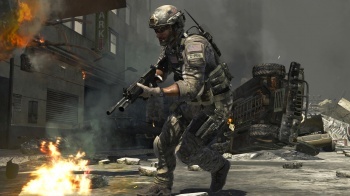 Call of Duty Elite has lots of free features, a fact that Activision is eager to share. The new Elite service for the Call of Duty games is not some scheme to force players to pay extra for the privilege of playing online, at least, not according to Activision. The publisher is defending the service, saying that it only adds to the "out of the box" CoD experience. Activision released an official FAQ for the service and one of its main points is that if players don't want to use the service, then they can just play Call of Duty like they always have and pretend that Elite doesn't exist. The publisher also released a chart showing which of Elite's features - at least the ones that have been announced so far - will be free when the service launches. Among other things, players will be able to join groups, which come with their own leaderboards and message boards, for free, as well as access a plethora of playing statistics. It looks like access to official tournaments and leagues - which according to the trailer come with actual prizes - will be part of the premium membership, but with the ability to create custom leaderboards for free, unofficial leagues and tournaments would be pretty easy to set up. You can read the FAQ here, and look at the chart here. While Activision doesn't enjoy the best reputation among publishers, Elite does look, for all intents and purposes, like a very robust free service with some premium elements. There's still more announcements to come too, and I wouldn't be remotely surprised if we didn't learn more at E3. Call of Duty Elite launches alongside Modern Warfare 3 on November 8th.